The Bible: True, Relevant or a Fairy Tale? The Bible is constantly condemned as outdated, legalistic, and irrelevant, yet it's widely owned and cherished worldwide. Despite ownership it often lies unread and scarcely believed, even by Christians. The reason - it's not accepted as the infallible word of God, but worse many reject it as fictitious and immaterial. Was there really a talking snake in the Garden of Eden? How could Moses possibly write a factual account of creation 2500 years after the event? Are abortion and homosexuality OK? Are God and Allah the same God? Robert skillfully demonstrates the answers through direct scripture quotation with little writer's bias. Paul tells Timothy, "all scripture is God breathed," and in Genesis we read, "God breathed into his nostrils the breath of life, and the man became a living being." If the followers of Jesus inhale the God-breathed scriptures their souls will truly abound with life. This book sets out to inspire Christians to believe God at his word. 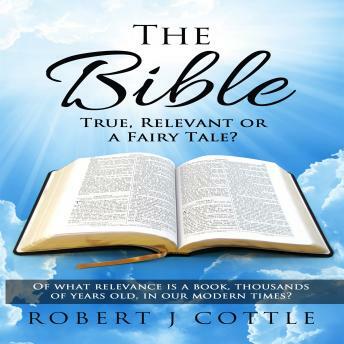 Bible: True, Relevant or a Fairy Tale?